DVEO will demo their Linux(r) based MPEG-2 to H.264 transcoders at InfoComm, the world’s largest audio-visual trade show, June 9-11, in Las Vegas, Nevada, in Booth N1576. Designed for A/V systems integrators and the cable, telco TV, and IPTV industries, MPEG Gearbox™ is DVEO’s new family of broadcast quality MPEG-2 to H.264 transcoders, or MPEG-2 to MPEG-2 scalers. Five systems are available: ASI to IP, ASI to ASI, IP to IP, and the newest systems, IP to ASI, and SMPTE 310 (8VSB) to IP. Each system transcodes one or two HD streams (1080i or 720p) or five to ten SD streams from MPEG-2 to H.264 or vice-versa, and outputs the streams over ASI or IP. The MPEG Gearbox ASI/IP and MPEG Gearbox SMPTE 310/IP can also receive 1 to 4+ MPEG-2 channels and output them to a dedicated IP network as MPEG-2 streams. Audio support is MPEG, AAC/MPEG-4, or AC-3 passthrough. The H.264/MPEG-4 compression standard uses up to 60 percent less bandwidth and disk space than MPEG-2 video, with no change in picture quality. 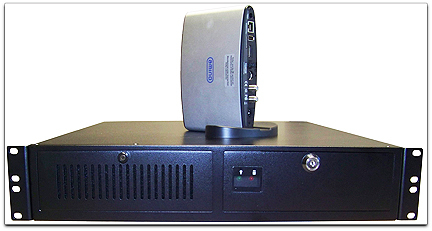 The three transcoders with IP output – MPEG Gearbox ASI/IP, MPEG Gearbox IP/IP, and MPEG Gearbox SMPTE 310/IP – generate IP streams that can be viewed on television sets with standard IP capable set-top boxes, or on computers using streaming video software clients such as VLC or Mplayer. MPEG Gearboxes are typically deployed in "closed" systems such as hotels, universities, and corporations, where bandwidth is dedicated and is used for this purpose only. MPEG Gearboxes feature very low latency, PID filtering of all unwanted traffic, and a simple GUI for operation. The H.264 transcoders support both NTSC and PAL, and can also be used as PAL to NTSC converters.